The assessment of the climate neutrality of bioplastics requires a particularly careful analysis as made recently by various institutes. In first place, it should be noted that raw materials from plants are climate neutral. However, in order to be able to make a qualified statement on climate neutrality, the entire production chain has to be considered, starting with the cultivation of raw materials and ending with disposal. The argument of climate neutrality cannot be held up particularly in the use of energy crops from conventional cultivation. The nitrous oxide (NO2) formed when fertilizing has been proved to be particularly damaging to the environment. However, by adhering to standards of sustainability throughout the whole production and disposal chain, climate benefits and a positive ecological balance can be achieved compared to conventional plastics. Biologically degradable bioplastics show a particular environmental effect. 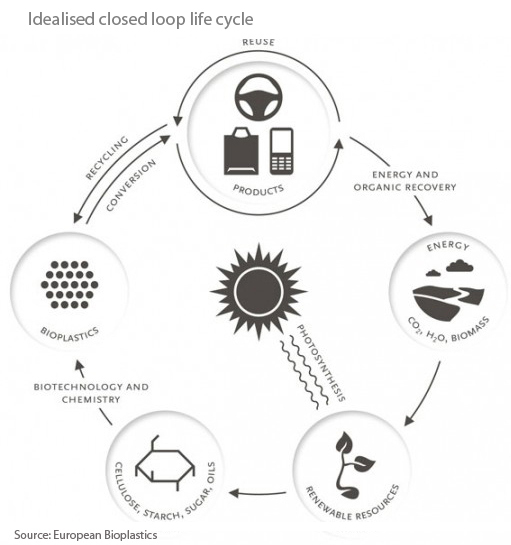 Should bioplastics be also obtained from renewable raw materials, a closed carbon cycle can be spoken of. The biomass required for production of plastics is made available again for recovery through the growth of new plants by composting and therefore contributes to the binding of CO2 to the soil. But even if bioplastics are used in a waste incineration plant for power production, the amount of CO2 liberated on burning is only as much as was taken previously for plant growth. However, composting of bioplastics has often not been easy so far, as it requires an environment which only exists in industrial composting facilities. Many of these plants are opposed to the acceptance of bioplastics after a background paper of the German Environmental Aid concerning the long time required for its decomposition. Possible solutions for this would be the establishment of a separate recovery system and further development of bioplastics to reduce decomposition time. Many manufacturers already exceed the requirements of the certification standards significantly today, so that their products already show greater compostability. Biodegradable plastics also contribute to avoid the problem of waste disposal. Only a very small share of the global production of plastics is being recycled currently. The majority of plastic waste either contributes to CO2 enrichment in the atmosphere through incineration or to pollution and poisoning of oceans and the landscape. Over 3 million tons of plastic are already forming an island in the Pacific of the size of Central Europe. The degradation of conventionally produced plastics usually takes several centuries, depending on environmental conditions, in addition frequently releasing toxic substances. 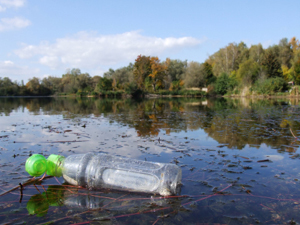 However, the long-term goal must be to establish a separate recovery system for bio-plastics. Despite the obvious effect of saving ressources, a re-use can help alleviating a common accusation: the competition for land between food and industrial products. Bioplastics Instead of Food? Competition for Land in the Development of Bioplastics Must Be Avoided. The use of farmland for industrial products instead of food production is to be seen as problematic. This dispute flared up especially before the 2008 financial crisis, due to a sharp rise in biofuel production and the resulting rise in food prices. In principle, this problem is also relevant for the bioplastics industry. However, due to the small volume of the bioplastics market, it can be assumed that competition with food production is not economically relevant in the short term. In this sense only 0.1% of the arable land in the EU27 was necessary to cover the entire European demand in 2008.2 Besides, waste from agriculture can already be used partially for the production of bioplastics today, so that no competitive situation exists any more. In order to avoid this also in the medium and long term, making this manufacturing method has to be expanded further. In addition, it is also to be assumed that in view of the increasing importance of electric mobility, fewer surfaces will be required for the production of biofuels in future. The freed-up capacity could be used for the production of bioplastics, helping to improve the income situation of agriculture and develop rural areas. Get Away from Oil! Bioplastics as Sustainable Resource Savers. By using renewable resources for production instead of petroleum, bioplastics can help to reduce dependence on petroleum. Due to the ever increasing demand for oil while the discovery of new deposits decreases simultaneously, steadily rising oil prices are to be expected in the long term. Although there have meanwhile also been price increases in energy-rich plants due to the increased use of biofuels, they have been much lower than in the case of oil. For this reason, the plastics industry may succeed severing itself from the price increases for imported oil while gaining security of supply through the use of bioplastics at the same time. In addition to this primary economic purpose, a closed carbon cycle results from the use of renewable resources, serving the sustainable management of natural resources. Overall, there are significant environmental benefits in switching from conventional to bioplastics. As a result of the ever-growing debate on sustainability, the use of bioplastics offers, despite its generally higher the opportunity to build a green image costs for many companies, which also pays off economically.